Dentist, Tom Rodgers B.D.S. (QUB 1995) opened the practice in Blackrock, Dundalk, County Louth in 2007 having previously worked as a dentist in Dundalk. Dentist Gonzalo Lopez Baillo joined the practice in 2014 providing dental implants. Experienced dentist, Dr. Laura Connolly joined the practice in 2018. 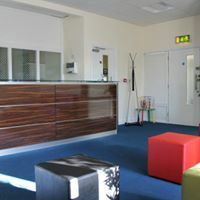 Dental Surgery is on the 1st floor of The Blackrock Village Centre in Blackrock Village 4 miles South of Dundalk. The surgery has a panoramic view of the village and Dundalk Bay. We provide dental treatment privately, under The Dental Treatment Benefit Scheme (PRSI) and under the dentist Medical Card Scheme. A wide range of treatment options are available, including routine dental treatment, extractions, tooth coloured fillings, root canal treatment, hygienist services, dentures, crowns, bridges, veneers, tooth whitening, dental implants and cosmetic dentistry. We take great care managing treatment for nervous patients and are delighted to have a large number of children attending the practice. We always fit emergency appointments into our schedule when required for toothache or dental pain. Our patients our greatly reassured that we place a huge importance in follow up care after any treatment is done and will always contact you within 24-48 hours of any treatment to check that everything is fine afterwards..
We are committed to providing high quality dental care, using the latest materials and techniques in a caring and friendly atmosphere and at a competitive price resulting in our patients maintaining healthy teeth and gums. The practice is fully computerised and uses digital radiographs. .
We strive to form a partnership with every one of our patients so that they can receive the most appropriate treatment and care, provided in a relaxed and friendly environment.